One of the problems with these options is that they don’t support DHCP so you have to hardcode your IP address in the firmware. Besides they seem to cost too much – for this kind of money it would be cheaper to get wireless shields. One alternative that I have come accros is to use self contained ethernet to serial bridges, while these might not be any cheaper from the previously mentioned options, they are more powerful. 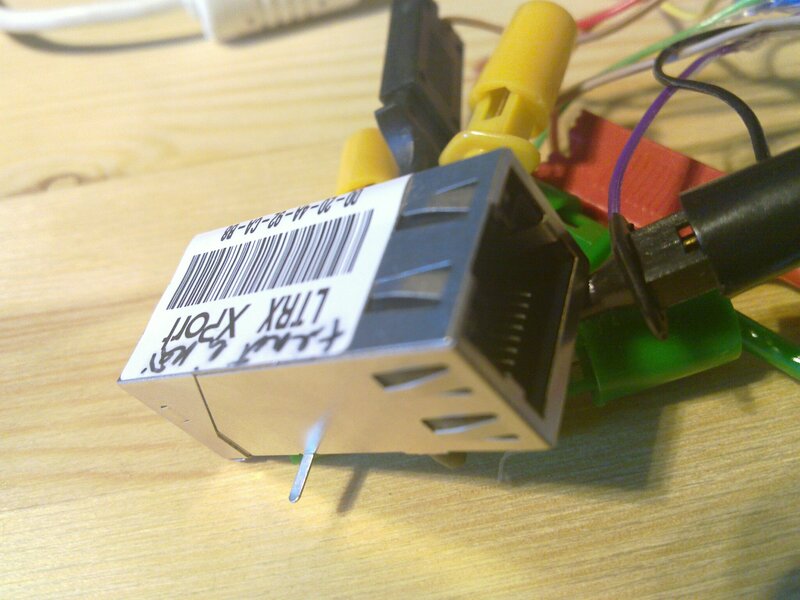 These modules are not much larger than the RJ45 socket itself and are extremelly easy to interface to any controller. Support exists for TCP, UDP, DHCP, SNMP, AES encryption and you can actually configure it to send e-mail when IO pin is triggered so for some extremelly simple applications you might be able to avoid the controller alltogether. What I’m talking about is the XPort from Lantronix. I happen to have one laying around since we used this in one of the projects many years ago. Nowadays I think you should be able to get one for ~30€ if you search long enough. There’s also a newer generation available called XPort PRO that has full linux running inside of it which allows you to do far more but costs far too much for me (~60€). There’s also a cheaper and very powerful alternative from Digi called Digi Connect ME 9210 with full Linux running inside it (39€). It has more pins and you should be able to do things like bridging 1-wire sensor network to ethernet without any external controller. I have no experiences with that device though and haven’t found any useful discussions about it so far. So anyway to get the XPort up and running you first have to give it an IP address. There are basically 2 ways of doing this – either with DHCP (the easy method) or over serial. 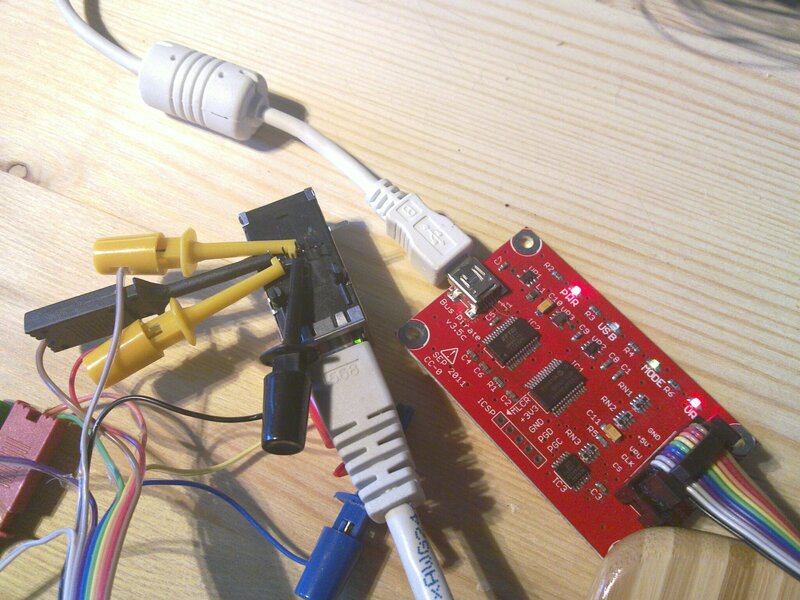 Since I wanted to learn a bit about using my Bus Pirate I used it to communicate with the serial port and verify that I can actually enter the serial setup if I wanted to. 9 Save and exit            Your choice ? 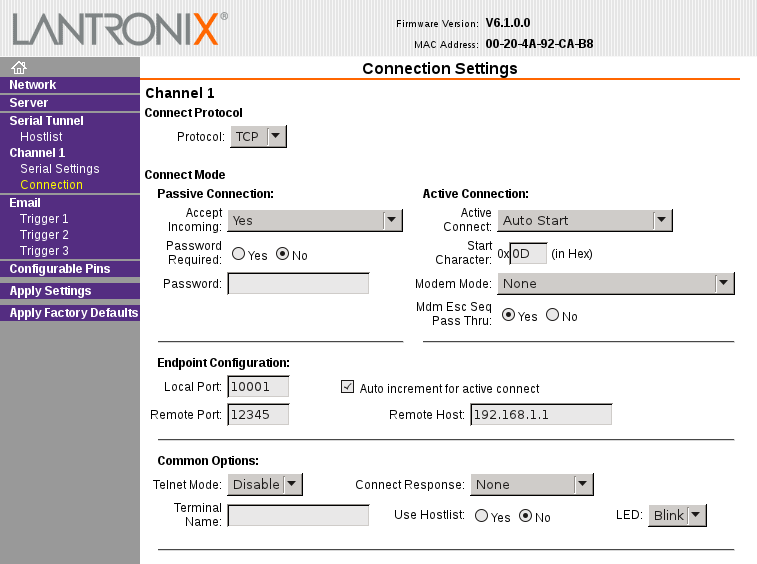 At this point you could go on configuring the device over the serial connection but it’s a bit incovenient so I just gave it an IP with DHCP and used the web interface for configuring. So with this configuration the XPort will connect to TCP port 12345 on 192.168.1.1 right after restart and we can use this channel to talk over serial port. You should now see test on the netcat shell and anything that wou write into the netcat session should show up on the buspirate shell. This entry was posted in hacks and tagged domotics on April 15, 2012 by hadara.